People walk inside Baghuz, the Islamic State group's last pocket of territory in Syria, Sunday, March 17, 2019. Hundreds of Islamic State fighters making a last stand for the terror group's self-declared caliphate lost control of their "tent city" in the northeastern Syrian town of Baghuz, in what U.S.-backed forces described as a significant blow. Syrian Democratic Forces made the announcement Tuesday on social media, following an operation, which resulted in the capture of what they described as 157 experienced IS fighters, many from outside Syria and Iraq. "#SDF is in control of Daesh encampment area," spokesman Mustafa Bali wrote on Twitter, cautioning, "This is not a victory announcement." "Clashes are continuing as a group of ISIS terrorists who are confined into a tiny area still fight back," he said, using another acronym for the terror group. A media official with the Kurdish YPG militia, which has been aiding in the campaign against IS, also said the battle had shifted to the outskirts of Baghuz. "A group of terrorists are remaining on the edges of Euphrates and haven't surrendered yet," Zana Amedi announced on Twitter. The U.S.-backed forces said hundreds of injured or sick IS fighters also had been evacuated from the town and taken to nearby military hospitals for treatment. The U.S.-led coalition Tuesday described the fighting as sporadic due the ongoing presence of civilians. "The enemy is still using civilians as shields, as well as dressing up in female attire to either try to escape or cause death by employing suicide vests," Operation Inherent Resolve spokesman, Col. Sean Ryan, told VOA. "The safety of civilians has remained paramount, thus making fighting sporadic at times," he added. In the meantime, the coalition said air and artillery strikes were still being carried out in support of the SDF offensive. On several occasions, SDF officials said victory was near, but time and again the fight was slowed by fierce fighting and the presence of tens of thousands of civilians, many the wives, children and family members of IS fighters. Despite the progress Tuesday, SDF officials did not say how many fighters remained, nor how many additional civilians or IS hostages were present. More than 4,000 people have fled Baghuz since the SDF resumed its final assault on IS just over a week ago, and previous estimates by both the SDF and the U.S.-led coalition have been way off. SDF officials initially estimated about 1,000 civilians and 300 fighters were holed up in Baghuz shortly after the operation to liberate Baghuz got under way last month. But since then, more than 30,000 civilians, including thousands of IS fighters, have surrendered. This past Sunday, SDF spokesman Kino Gabriel said more than 5,000 IS fighters had surrendered over the past month, while another 1,300 had been killed in the fighting. Hundreds more were captured as part of SDF operations, he said. But at the time, SDF officials also estimated as many as another 5,000 people might still be hiding in Baghuz. "We have been consistently wrong, as have our SDF partners, on how big this is," a senior U.S. defense official said earlier this month. U.S. defense officials say one reason for the vast underestimation of the number of people and fighters may be due to Islamic State's extensive use of caves and tunnels, which have made it difficult to see just how many people remained entrenched in the ever-shrinking sliver of land. Various U.S. and SDF officials have described the cave and tunnel system under Baghuz as complex, with some initial intelligence suggesting the tunnels ran for more than two kilometers, capable of hiding an unknown number of fighters. FILE - A fighter walks through a tunnel made by Islamic State fighters, Oct. 18, 2016. 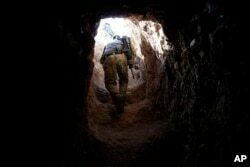 Officials also expected the tunnel system would be rigged, full of traps and explosives designed to slow down any attempt to clear out IS fighters while at the same time inflicting heavy casualties. But so far, SDF officials have not said what remains of the tunnel system or how long it may take to clear it of IS resistance. Earlier this month, the commander of U.S. forces in the Middle East, Gen. Joseph Votel, warned the slow, drawn out fall of Baghuz, including the periodic surrender of thousands of civilians, was part of a "calculated decision" by IS to allow the group to complete its transition to a clandestine insurgency. Despite losing administrative control over almost all the land it once held in Syria and Iraq, U.S. defense officials caution IS still has "tens of thousands" of fighters working either as part of sleeper cells or as part of an active, clandestine insurgency. Additionally, senior officials said most of the group's senior leadership, including its self-declared caliph, Abu Bakr al-Baghdadi, remain at large. 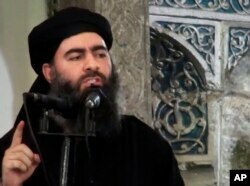 FILE - This image made from video posted on a militant website July 5, 2014, purports to show the leader of the Islamic State group, Abu Bakr al-Baghdadi, delivering a sermon at a mosque in Iraq. On Monday, IS spokesman Abu Hassan al-Muhajir released a new audio message online, vowing the liberation of Baghuz by the coalition would not signal the end of the terror group. "Here is America declaring a false victory that has no bearing on reality," he said, according to a translation by SITE Intelligence. Former U.S. counterterrorism and intelligence officials said Tuesday that while IS's self-declared caliphate would soon face an ultimate defeat, the terror group will live on, as will its dangerous legacy. "The idea of a caliphate existing in the here and now, in 2017, 2018, 2019 — that genie is out of the bottle," Matthew Levitt, a former FBI counterterrorism analyst, said Tuesday during a panel on extremism in Washington. "It's more authentic because it's real," he said. "It's not something in history that you read about in a book." Juan Zarate, who served former U.S. President George W. Bush as a deputy national security adviser, added that the collapse of the caliphate is also unlikely to dishearten IS supporters. "They will rationalize the loss. They will rationalize it in part because they have a very long-term vision of their own movement in history," he said. "They will see this as just one chapter."